Stands in the graveyard at the top of Marina. Mary was a Scottish missionary who lived in Old Calabar (as it used to be called) from the late nineteenth century until her death in 1915. Her memory is cherished in the city for having led the movement to abolish the killing of twins. A friend's father has friends who were saved from this fate by her. Her grave is the cross on the left of the image (seen from side on). The graveyard was sadly locked when I was there (hence the angle of the photo - taken from the gate), but peering over the fence, it seems like a tranquil place, the only noise the gentle susurrus from the surrounding trees - the perfect resting place for a noble soul. As you would have noticed, they do not go for walks in cemeteries as we do in England. I remember when I first visited Brompton Cemetery, I could not sleep for weeks, then I got used to visiting cemeteries to contemplate and meditate apart from always looking out for the mausoleums from the common tombstones. Even death is not a complete leveler. According to most anthropologists, “ancestor worship” and veneration is a very ancient practice. Perhaps what you are saying here is that many African cultures reserve this for lineage relatives rather than the nation or public as a whole. 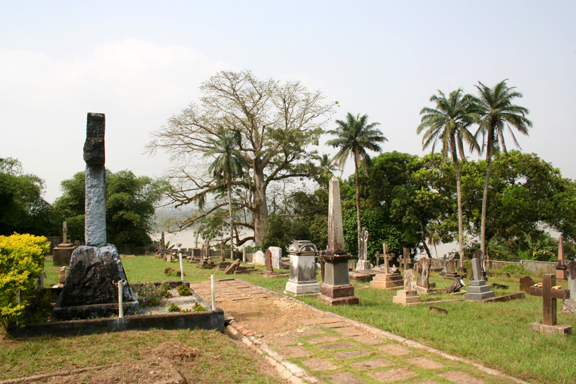 Are there African leaders whose grave sites are venerated? Most anthropologists claim that “ancestor worship” and veneration is a very ancient practice. Perhaps many African cultures reserve this for lineage relatives rather than the nation or public as a whole. Mary Slessor appears on one of the Scottish 10 pound notes (see this site), which also features a map of the area she worked in. The National Museums of Scotland published an interesting book about her in their Scots Lives series. When I was there this August 2012 the graveyard was totally neglected and untended to say the least. The ground was overgrown, there were no walking paths at all. It was very sad to see but the still the atmosphere was lovely with the sea breeze.